Tired of turkey sandwiches? 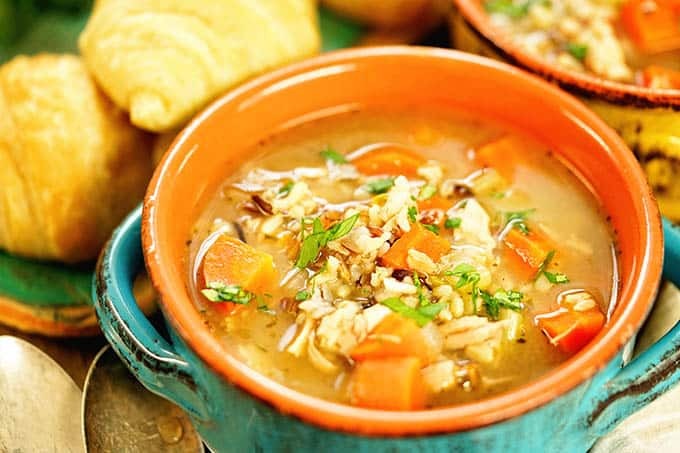 Transform your leftovers into an easy Wild Rice and Leftover Turkey Soup! Savory, delicious and filling this is an easy soup to make with holiday leftovers! Hey, guys, it’s Deb stopping by from Bowl Me Over! I know it’s Thanksgiving and you’re prepping your turkey and spread, but we had our Thanksgiving early and all the family gathered round on Sunday. That means by today… we’re really tired of eating turkey sandwiches! I’m all about transforming leftovers! Using leftover rotisserie chicken or turkey in Lemon Chicken Orzo Soup – so delicious! Or 20 Minute Chicken Noodle Soup, yum! Leftover ham is turned into Deviled Ham or Navy Bean Soup with Ham – I’m a firm believer in not wasting food and repurposing a great meal! You probably have everything you need, but just in case – here are some substitutes! No wild rice? Use white or brown rice, just adjust the cooking time. Don’t have carrots or celery? You can use leftover veggies from your vegetable tray. Wasn’t any turkey left? Leftover rotisserie chicken works just fine! Can I add leftover green bean casserole? You bet! 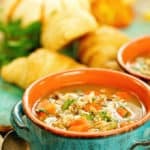 Now you’ve gotten creamy wild rice and leftover turkey soup-yum! What spices do you use in turkey soup? In this recipe, I use Italian seasoning, garlic powder and salt and pepper. Optional spices include red pepper flakes or chili powder – just a pinch of either will give it a little zip! A squeeze of lemon at the end and a handful of minced parsley will brighten the flavors of this easy meal. Dice the vegetables and turkey. Heat a large stock pot on medium heat, add the butter and olive oil and all of the vegetables. Sauté for 5 minutes. To the stock pot add the wild rice and seasoning, mix to combine. Add the chicken stock and water, increase the heat to high and bring to a boil. Reduce heat to low and cover. Cook according to package directions for the rice. Finish with a squeeze of lemon and minced parsley. 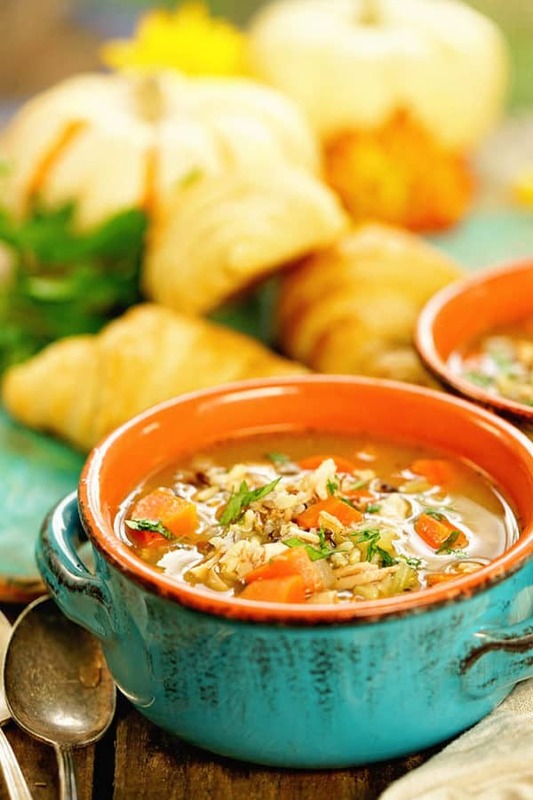 Transform your leftovers into an easy Wild Rice and Leftover Turkey Soup! Savory, delicious and filling this is an easy soup to make with holiday leftovers! Dice the vegetables and turkey - white meat or dark meat, use your favorite! Heat a large stock pot on medium heat, add the butter and olive oil. When hot and bubbly add all of the vegetables and sauté for 5 minutes. Add the wild rice and seasoning, mix to combine and saute for a minute or two. Next, add the chicken stock and water, increase the heat to high and bring to a boil. Reduce to low and cover. Optional - Finish with a squeeze of lemon and minced parsley to brighten the flavors of this easy soup! Debra Clark blogs over at Bowl Me Over where she shares her love of all things in a bowl! Soups, stews, salads, Buddha bowls, BBQ, ice cream you name it! All are delicious and full of flavor. Most are quick, easy and healthy too! You can also connect with her on Facebook, Pinterest, Instagram, Twitter and YouTube.